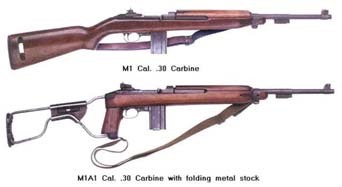 The M1 Carbine is a carbine version of the Garand semi-automatic rifle that was a standard firearm in the USA military during World War II and the Korean War. The basic idea of the gun was in response to the blitzkrieg tactical doctrine of the Axis. Facing an enemy that used this tactical approach meant that support troops could come under direct attack by front line forces. In anticipation for this possibility, this carbine was commissioned to supply an adequate defensive weapon to those troops. However, the weapon was also adopted by regular troops since it had a good rate of fire and a superior range to a submachine gun, but it was less unwieldly than a regular M1 Garand rifle which made it suitable for close quarters combat. The folding version was also favored by paratroopers, due to its low weight and compactness, yet was more powerful than the previously issued Tommy Guns. During the two wars in which it was used, 6.25 million M1 Carbines of various models were manufactured, thus making it the most produced small arm in American military history.